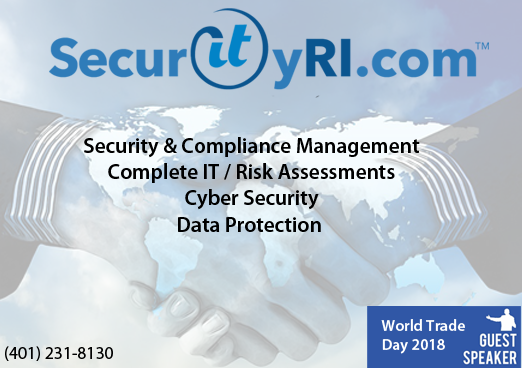 SecurityRI.com is proud to announce our technology team will be attending and speaking at the 33rd Annual World Trade Day: Technology in Global Trade on Wednesday, May 23, 2018. World Trade Day is presented by the John H. Chafee Center for International Business and is one of the region’s largest international business conferences, with more than 500 industry leaders and business executives expected to attend. In closing, the goal of World Trade Day is to bring together experts and leaders to share knowledge, vision, and opportunities for growth and success within the global marketplace. That’s why SecurityRI.com has been invited to advise on the complex issues associated with both personal and sensitive business data, including its collection, use, storage, disclosure, transfer and destruction. If you have any questions regarding the event, please contact us or comment below.